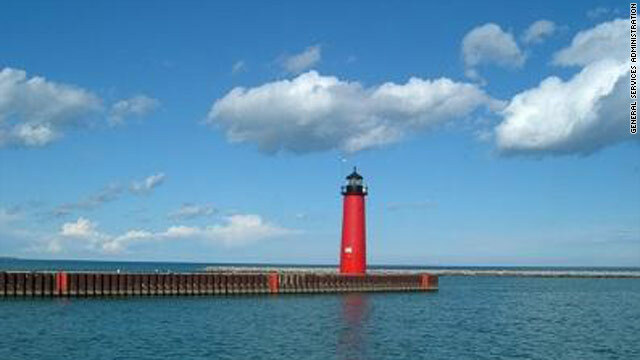 Bidding stands at $13,000 for the Kenosha North Pierhead Light in Wisconsin. If you have always wanted the tallest house in your neighborhood, here's your chance. As of Tuesday morning, the Kenosha North Pierhead Light in Wisconsin is sitting at $13,000. In Ohio, three bids for the Fairport Harbor West Breakwater Light have risen to $39,500. The bidding ends Wednesday for both. You have another week to bid on Ohio's Conneaut Harbor West Breakwater Light, which has drawn but one bid for $5,000, possibly because it could not easily be converted into a home or bed and breakfast. "They're in varying states of repair or disrepair," General Services Administration official John E.B. Smith told The Washington Post. "They're not cheap to maintain." The lighthouses are outmoded by more modern means of navigation but still have historical value. The U.S. Coast Guard and National Park Service are offering them under the National Historic Lighthouse Preservation Act of 2000. Interested organizations need to submit a letter and complete a stringent application process. If no suitable steward is identified, the lighthouses will be auctioned to the general public, the GSA says. Honey I'm going to sleep at the light house tonight. Don't miss me. What can u do with a lighthouse anyway? ...needs to take a vacation. ...and an island for Christmas. I'm wondering if the government wants to keep all good stuff an sell the rest. I know about Pt. Fermin in San Pedro. The last time I saw it, about 4 yrs ago, it was decommissioned, but in very good shape, in fact the house was being lived in. I don't know about the other lighhouses that the gov. doesn't want to sell. Mortgage rates are historically low you can easily refinance these days your mortgage to 3%. It is the best way to save money. Search online for "Refinance 123" they did 3.54% refinance and free analysis of my current mortgage. Learn the refi secrets there. Hello there, You've done an excellent job. I'll definitely digg it and individually recommend to my friends. I'm confident they'll be benefited from this web site. Normally I do not read post on blogs, however I would like to say that this write-up very pressured me to try and do it! Your writing style has been amazed me. Thank you, quite nice post. I also caught the news on AOL when I singed in (dialup days) but dismissed it as a freak accident until the second one hit. The afternoon class was called off but spent 15 hours straight glued to the TV watching umpteen repeats of the planes crashing in the towers..As Le Monde said, we were all Americans that day. I am extremely inspired together with your writing skills as well as with the layout for your weblog. Is that this a paid subject matter or did you modify it yourself? Anyway stay up the excellent high quality writing, it's uncommon to see a great blog like this one these days..